was first elected in 1986 and served 20 years. Charles Plummer, who served 20 of his 54 years in law enforcement serving as Alameda County sheriff, passed away Monday. He was 87. Stern in a paternal way, Plummer appeared to perfectly fit the mold of a mid-20th Century law man. Referring to his first job in law enforcement, serving in the Berkeley Police Department in the 1960s, Plummer remarked at his retirement ceremony that he wished he would have been more firm with protesters at the famed 1969 People’s Park riots. Before becoming Alameda County sheriff, Plummer served 10 years as Hayward police chief, starting in 1976. It was during his time that Plummer implemented simple guidelines for police behavior that he termed, “Cardinal Sins.” This rules remain a standard in police training. 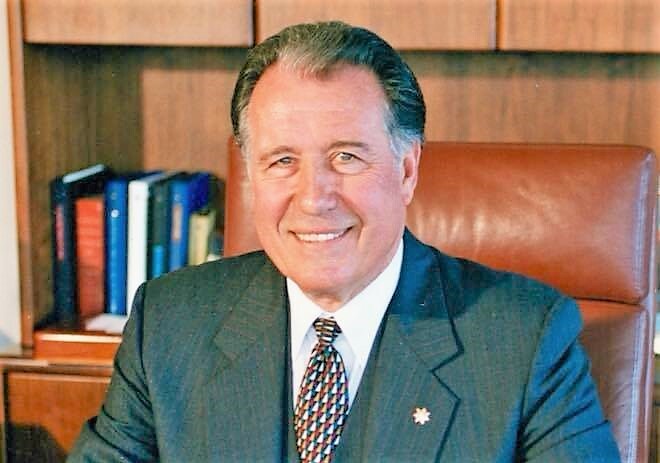 Elected sheriff in 1986, Plummer tenure began with the opening of the Santa Rita Jail in Dublin. He served in the position for 20 years before retiring. He was replaced by current Alameda County Sheriff Gregory Ahern. Plummer’s advocacy, however, continued after leaving the sheriff’s office. He remained connected to Alameda County politics, often making appearances before the Board of Supervisors in support and opposition of various issues. Posted in Alameda County, Alameda County Sheriff, Berkeley Police, Cardinal Sins, Charlie Plummer, dies, Gregory Ahern, Hayward Police, Scott Haggerty. Bookmark the permalink. Libby Schaaf: ‘Bay Area liberal standard-bearer’? Jeff Sessions: How dare you! Libby Schaaf: How dare YOU!